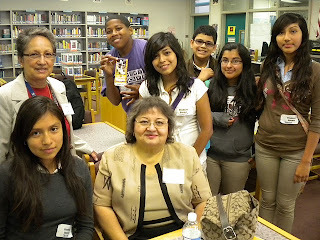 This event was well-received by students who learned about a wide variety of careers throughout the day. Over 50 presenters were eager to talk to students and share information about each of their careers. Poignantly, one student asked why no teachers came to present at the Career Day. He reprimanded the organizers for not including teachers. Touche. It's been a busy month at the Academy and we have not been able to post as frequently as in the past. But for those of you who work in South Central, Friday was a day to remember. Friday morning around 11:00 am, a massive explosion rocked the neighborhood. The explosion was so powerful it shook all the buildings on campus. It turns out the explosion came from a titanium fire at a recycling plant less than a block away from our school. 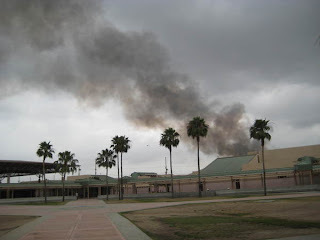 The plumes of fire and black smoke immediately rose over the back of our school building, but thanks to the staff's professionalism, all students were safely secured in their classrooms within 30 seconds of the explosion. The school immediately implemented the Shelter-In-Place policy and all support staff checked the campus for any stray student, parent, guest, etc. The lock down lasted 4.5 hours.